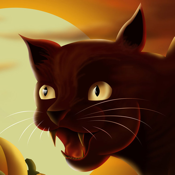 This excellent Halloween themed game, "Halloween Sequence", is going to help you as it will allow you to practice your intellectual facilities and concentration. The game contains two modes: Practice and Challenge. In the Practice game mode, there are three levels to choose from: Easy, Normal and Hard. They vary in terms of the number of Halloween things (3, 4 or 5) whose order of appearance the player must remember. If you choose this game mode, you must remember the order in which the things, shown later on the plates below, appear on the screen. Touch the screen, the plates go blank and you must indicate the Halloween things you see in the same order as they appeared on the plates. Easy, isn't it? Once you become skilled, try something more difficult and go to the Challenge game mode. In this mode, you must remember in which order the Halloween things appear on the screen and then indicate them in exactly the same order. Each sequence which you remember correctly earns you a point. So if you have your own account in the Game Center, you can compete for the first place in the ranking of the world's best players.